Before, we posted reviews on 5 Magento 2 gift card extensions. Below you can find their comparison. All these Magento 2 modules, Amasty Gift Card, Aheadworks Gift Card, MageWorx Gift Cards, Magestore Gift Card, and M-Connect Gift Card, provide the ability to add a new product type to your ecommerce store – a gift card. Is the difference between the Magento 2 extensions that share similar functionality essential? You will find the answer below. The first and most important thing about Magento 2 gift card extensions is a gift card value. Note that a reliable Magento 2 gift card module should provide at least two value types: fixed and custom. At the same time, custom values can be different as well. It can be any value or a range of predefined values between the minimum and maximum amounts. Let’s see what Amasty, Aheadworks, Mageworx, Magestore, and M-Connect offer. 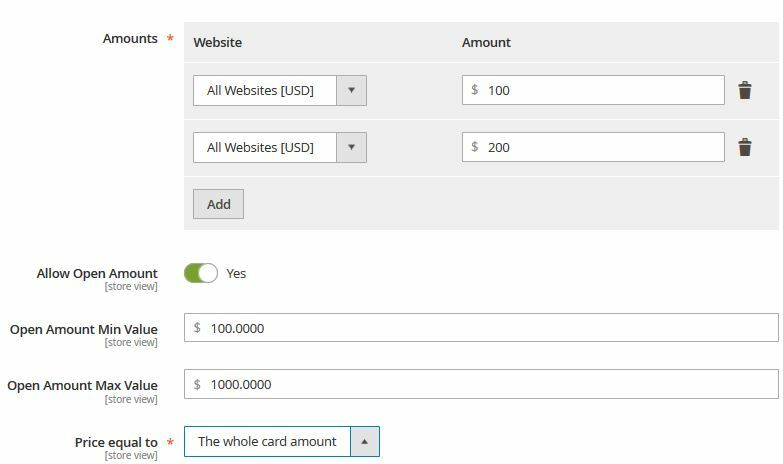 Amasty Magento 2 gift card module adds a drop-down with several fixed values and a custom parameter. A store visitor can select a custom amount and specify it considering minimum and maximum values. From the admin perspective, everything is customizable from the gift card product settings: you can define the number of fixed values, as well as set limits for a custom amount. 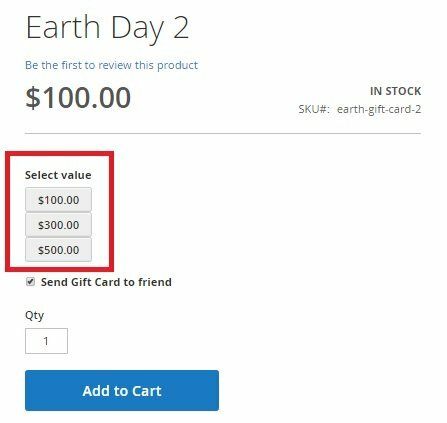 The same is about the Aheadworks Magento 2 Gift Card extension: you provide several fixed values and a custom amount limited by minimum and maximum possible values. As a store administrator, you can add an unlimited number of fixed values, as well as enable or disable gift card open amount and set its limits. In case of the Mageworx Magento 2 gift card extension, things are a little bit more complicated. The Magento 2 gift card module offers three price types: a fixed price that is specified by a store admin, drop-down with the prices predefined by a store admin, and a custom amount from a predefined price range. Although the Mageworx Gift Cards Magento 2 module offers more freedom of choice, its admin interface is less user-friendly, so it is much harder to configure gift card prices. In its turn, the Magestore Gift Card Magento plugin supports all three price types offered by Mageworx but provides a backend interface that is as intuitive as the interface of the Amasty Gift Card or Aheadworks Gift Card. Due to the combination of advanced functionality and simplicity, the Magestore gift card Magento extension becomes a leader in certificate values comparison. In this regard, M-Connect offers distinct features. For instance, the extension allows merchants to fix the value of certificate for a single storefront or multiple storefronts. A Magento 2 online merchant or admin can add as many amount options as they wish to offer to their shoppers. Besides the merchant, the extension also passes the same authority at frontend to the frontend users, by allowing the option for the extensive amount at the backend. Thus, a merchant can grant permission to the shoppers to enter the value of gift card they are going to send to a recipient. To keep profit/margin intact for the gift card selling, merchants have provision to set the minimum value as well as the maximum value of the gift card, when the extensive amount settings allowed for the shoppers at the frontend. Thus, gift card buyers have to select the certificate value in between the minimum and maximum amount set by an admin at the backend. Finally, it offers price equal to option with two selections: the whole card amount and the percent of card amount. It is a distinct feature of the M-Connect gift card extension, and, probably, no contender is offering such a decent and intuitive for any level of Magento user backend as they do. A reliable Magento 2 gift card module should provide several card types, like virtual and physical. Also, there could be a combined type. So, what about the participants of this comparison in this regard? The Amasty Magento 2 gift card extension provides all the three types mentioned above: Virtual, Printed (physical), and Combined. You can choose a card type in the gift card product settings. The same is about Aheadworks Magento 2 Gift Cards: all the specified types are available, but the settings are more hidden. While in case of Amasty it is the first option, Aheadworks puts it in the Gift Card Information section at the end of the product settings. What about the Mageworx Gift Cards Magento 2 module? The company decided to reinvent the wheel and divided physical gift cards into two types: Print and Offline. The first one allows customers to print gift cards at home, while in case of “Offline”, they are sent by post. Of course, there are virtual gift cards – this type is called Email. Looks good, but lacks the combined type for one of the physical types and the virtual one. In the backend, the appropriate option is situated at the end of the list of settings, while you create or edit a gift card product. The Magestore Gift Card Magento 2 extension does not offer anything new when it comes to gift card types. Here you can also choose between Physical, Virtual, or Combined types while creating or editing a gift certificate. The M-Connect Gift Card Extension is a standard extension consisting of all three options for the selection of gift card types for gifting in different ways. Virtual (or digital), physical (with adequate provision to send), and combined (to assure senders as well as recipients regarding delivery and use cases). Another essential aspect of a Magento gift card is design options. Amasty, Aheadworks, Mageworx, Magestore, and M-Connect allow you to choose images for your gift cards. Though, each vendor provides different opportunities when it comes to the appearance of gift cards. 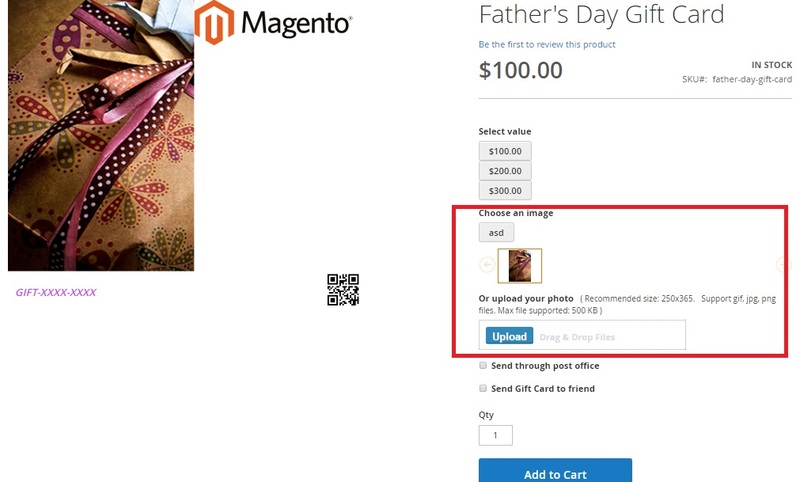 In case of the Amasty Magento 2 gift card extension, it is possible to use predefined images or upload your own ones, so that buyers can choose the right appearance. 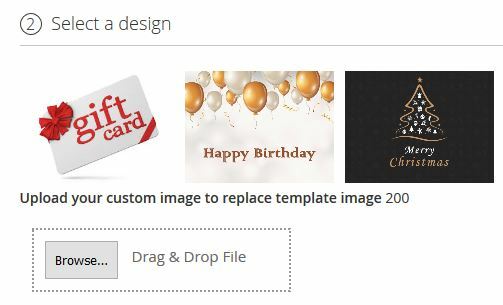 As for the Aheadworks Magento 2 Gift Card module, it does not allow uploading custom images, so your customers choose among provided pictures. Mageworx Magento gift card plugin offers a fixed gift card design. Perhaps, the most user-oriented extension is Magestore Gift Card for Magento. This Magento 2 module not only provides customers with the ability to choose among several image options offered by admins but also lets them upload their own photos! The same elegance is available in case of the M-Connect Gift Card Extension. 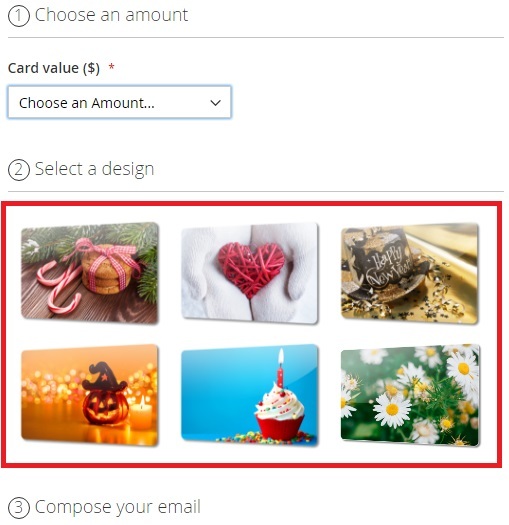 One can use predefined gift card images from 35 designs available, as well as upload a custom image from the frontend. A reliable Magento 2 gift card tool should contain a certificate code that can be applied in a shopping cart. It is the essential principle behind all gift cards. Thus, let’s figure out how this functionality is represented by Amasty, aheadWorks, Mageworx, Magestore, and M-Connect. Amasty allows you to create various code pools. In code pool settings, you can create a template and specify the number of codes to be generated. Alternatively, you can upload a CSV file with the codes. The Aheadworks Magento 2 Gift Card extension provides the ability to create codes via backend and send them manually. There is a separate section with all issued codes. Mageworx allows adding and editing gift card codes manually. Generating gift card codes in bulk is also possible with the module. As for the Magestore Gift Card Magento 2 module, it offers the most complex gift codes settings, so you can fully customize all aspects of providing customers with codes. It is possible to import gift codes in bulk or generate them within the extension. In addition to ordinary codes, there are also gift code sets. Besides, you can create an unlimited number of code patterns. M-Connect Gift Card Magento 2 module provides the ability to create an unlimited number of custom gift codes per different occasions. You can select gift card product setup initial value, expiration date, website store view and sender/recipient information from here. 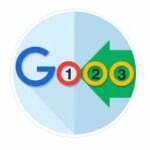 Gift card balance is a user-oriented aspect, so it is hard to overestimate its importance. Once a recipient inserts a gift code provided by the Amasty Gift Card Magento 2 Extension, the certificate balance becomes available on a customer account page. Customers can add unlimited amount of gift codes, delete used certificates, track balance, as well as check the expiration date. The Aheadworks Magento 2 Gift Card module provides the ability to check card balance. It is only necessary to enter a code in a customer account – there is a special field in the Gift Card section. 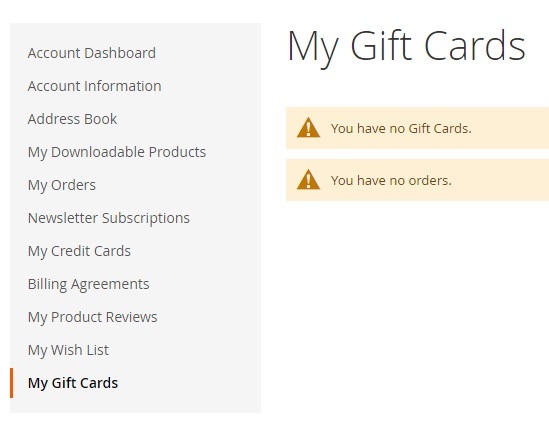 The Mageworx demo also has a section dedicated to gift cards in a customer account, but since no gift cards are available there, we were unable to check its functionality. 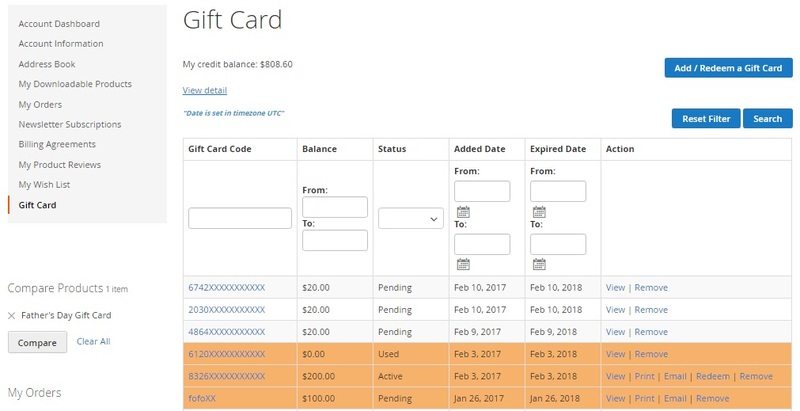 The Magestore Magento 2 gift card extension offers the most user-friendly customer account that contains a grid showing gift card balance, expiration date, and other parameters. With M-Connect user-friendly customer account, the gift card section includes all information about the gift code balance, such as Gift Code, Sender name, Initial Balance, Current Balance, Added Date, Expire Date, and Status (active or expired). It is also necessary to keep track of all purchased Magento 2 gift certificates through the backend. Therefore, let’s see what our extensions offer in this way. 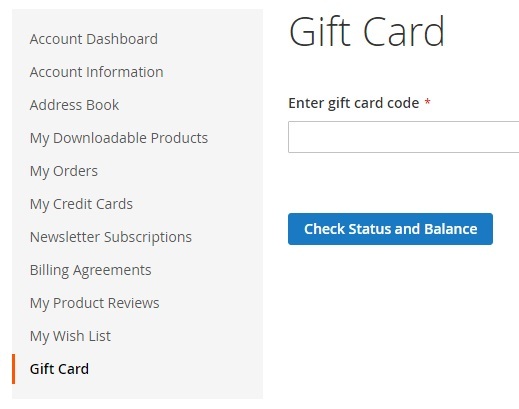 There is the Gift Card Accounts grid in the backend of Amasty Magento 2 Gift Card. Here, you can keep track of all purchased gift certificates, edit certificate data, resend gift codes, as well as view purchase history. Backend controls of Aheadworks Magento 2 gift card extension are also available within a grid. It displays the balance of issued gift codes and their status. You can activate, deactivate, or delete codes in bulk. Mageworx gift card Magento 2 module offers a grid with codes as well. You can edit, delete, or resend each code individually. Besides, it is possible to view each code stats. With the M-Connect Gift Card Magento 2 module, admins can track all the information about gift code usage with essential details like order ID, Name on a bill, Ship name, Total Order amount, Spent Amount, and Purchase Date. Now, when you know core differences in the functionality of all 5 top gift card extensions for Magento 2, we should say a few words about their prices. Amasty Gift Card costs $249, Aheadworks Gift Card – $399 (don’t forget about 50% off for M1 users), Mageworx Gift Cards – $149, and M-Connect Gift Card – $103. Magestore Gift Card is now available as part of the Omnichannel solution. Now, we should figure out ecommerce needs for which each Magento 2 gift card extension is suitable. Let’s start with the Amasty Gift Card Magento 2 extension. This tool seems to be a reliable solution that covers all vital aspects of gift card creation, management, and tracking. 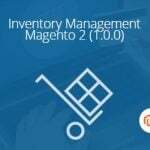 The price of the Magento 2 module is $249, and it seems to be a reasonable one. Aheadworks Magento 2 Gift Card costs an arm and a leg unless you are a company’s M1 client. What do we get for $400 ($200)? First of all, it is a reliable and easy-to-use extension that satisfies all basic requirements and goes even further. The interface is excellent, the functionality is comprehensive, the price is not that as normally expected (unless you are a company’s M1 client). Mageworx Gift Cards for Magento 2 is an excellent solution for $149! Yes, it has some limitations in various areas, but the Magento 2 module is one of the cheapest among the four tools. If you have a limited budget, we recommend you to pay attention to MageWorx Gift Cards – you will get the desired functionality without extra expenditures. M-Connect Gift Card Magento 2 extension is the best gifting customized solution for eCommerce merchants with the lowest price among the other modules. It will facilitate your customers to purchase and send unlimited gift cards, vouchers, or certificates per different occasions. You will get the best gift module at $99 only.